On the 3rd of February, 2016; IEEE AIUB student branch organized a seminar on "Modern Control Centers and Prevention of Large-Scale Blackouts of the National Grid" at room 266, Faculty of Engineering building, AIUB. The topic was of huge importance for electrical engineers in Bangladesh, as the electric grid is extremely susceptible to such problems. The seminar started with opening remarks from Prof. Dr. A.B.M. 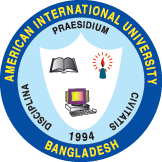 Siddique Hossain, Honorable Dean, Faculty of Engineering, AIUB. Following this Dr. Enamul Haq, Senior Advisor, California ISO, Folsom, California, USA; Senior Member, IEEE Power and Energy Society (PES) & Chair, IEEE Computational Intelligence Magazine (CIM) Task Force; took the stage. He started by talking about the North American electric grid and the different agencies overlooking different aspects of the grid. He then went onto describe the consequences of losing a substation, the causes of blackouts and a case of a worldwide blackout. He also shared his insights on the obstacles for renewable energy. Later, Mr. Farhadur Arefin, Assistant Professor, Faculty of Engineering, AIUB & Counselor, IEEE AIUB student branch and Dr. Md. Abdul Mannan, Head, Undergraduate Program & Associate Professor, AIUB; each delivered inspiring speeches. Afterwards, the speaker was handed a token of appreciation by Prof. Dr. A.B.M. Siddique Hossain, Dr. Md. Abdul Mannan and Mr. Farhadur Arefin, on behalf of IEEE AIUB student branch. Mr. Chowdhury Akram Hossain, Assistant Professor & Special Assistant (OSA), Faculty of Engineering, AIUB & Mentor, IEEE AIUB student branch, Mr. Shameem Ahmed, Lecturer, Faculty of Engineering, Dr. Abu Abdullah, Assistant Professor, Faculty of Engineering, AIUB, Mr. Mortoja Salequin, Lecturer and Mr.Khursiduzzman, Assistant Professor, Faculty of Engineering, AIUB; blessed the event with their presence.